The Pistachio Rolled Kadaif has its own fame in Turkey and in the world. 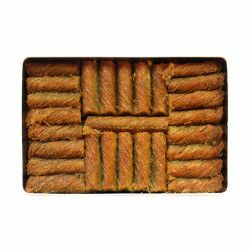 Kadaif pastry is a roasted shredded pastry made from flour and water. 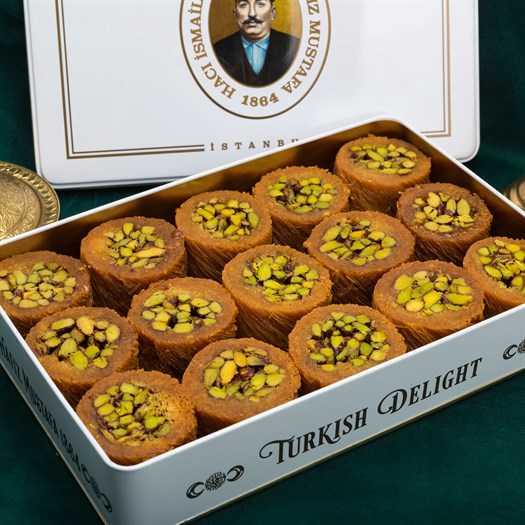 It is used in so many ways in the Turkish cuisine. 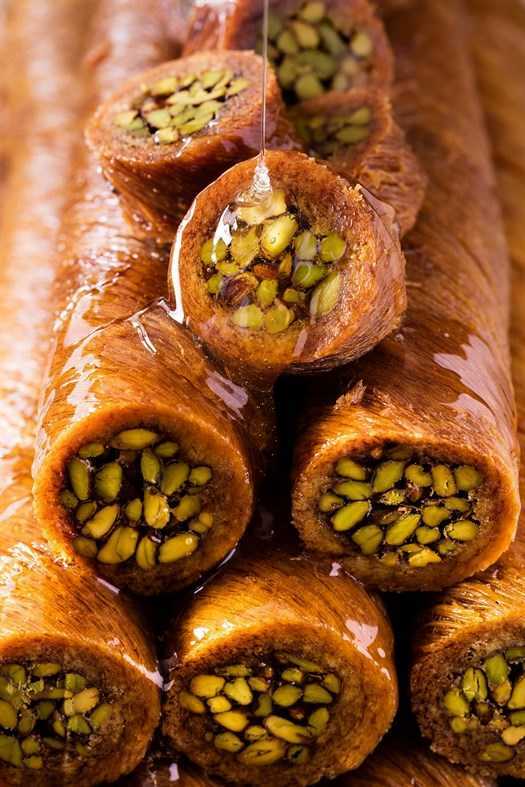 The Kadaif dessert is made from shredded pastry sweetened with syrup or milk. Its delicious taste gives you a great sensation. Kadaif has its origins in the Seljuk and Antolian principalities. It was known that the Turks love pastries and that is why their cuisine was very rich in those kinds of food, and the Kadaif was one of the most delicious desserts. 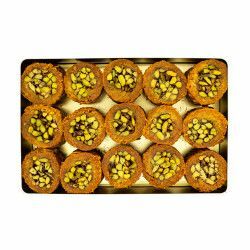 It is one of the irreplaceable desserts offered in our special days and in family meetings. The birthplace of Kadaif is Diyarbakir. How does Kadaif taste and what are its benefits? The initiative content of Kadaif is flour, which is derived from white, brown and yellow flours. The other ingredients are pistachios, water, sugar, lemon juice, butter and pekmez. 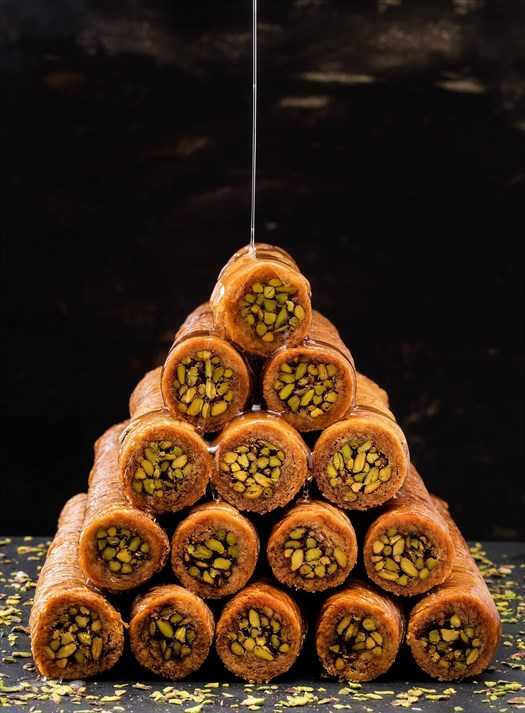 The water amount added to the dough and the quality of pistachio are the factors forming the unique taste of Kadaif during the production process. Its has a mild flavour so it does not cause stomach swelling. 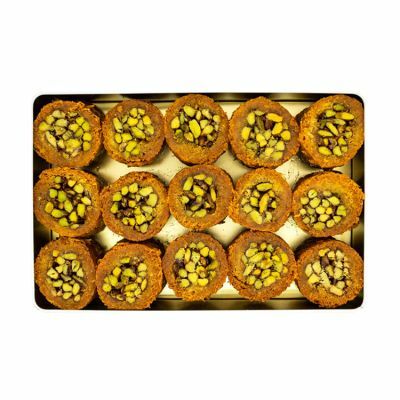 The Kadaif is filled with the smell of pistachios originated in Gaziantep, which is located in the Southeastern Anatolia. Besides, the texture of the syrup and the thinness of the shredded pastry determine its flavour. Our Pistachio Rolled Kadaif is made from the best and fresh ingredients. It is made by the most famous and dexterous chefs. Our production devision has the most technologically modern equipments which meet the international standards of Hygiene. And the security is at the forefront of the production. 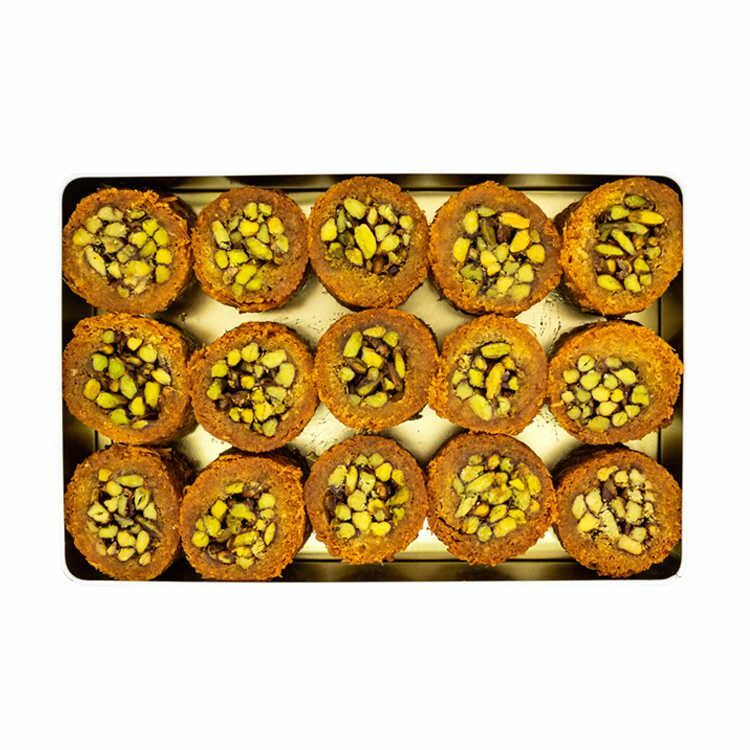 The Kadaif: We make the mixture of its pastry from water and flour. We let the dough rest then shred it. 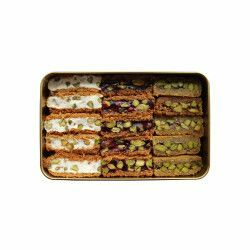 We take a handful of the pastry shreds, spread it out, sprinkle the nuts on it, and roll it up. We brush the baking tray with some melted butter and pekmez then place the Kadaif on it. We pour a mix of melted butter and oil on the top then bake it. After baking it the melted butter percolates into it. We sprinkle the ground pistachio and pour the syrup over the top. The syrup: we boil 5 glasses of water and 4 glasses of sugar for 15 minutes then we add a few drops of lemon juice and boil it for more 1-2 minutes. We pour the syrup on the Kadaif after removing it from the oven. It will be ready to be served after percolating the syrup into it. What are the shelf life and the storage conditions of Kadaif? 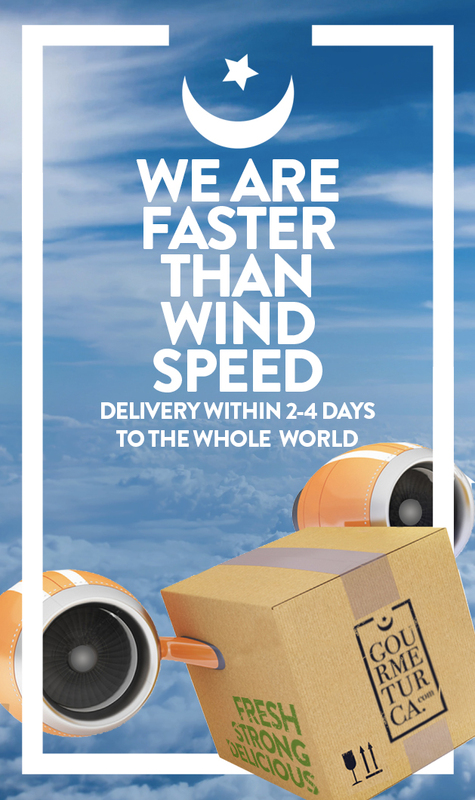 The shelf life of Kadaif is 15 days as long as you keep it in a cool and dry place. 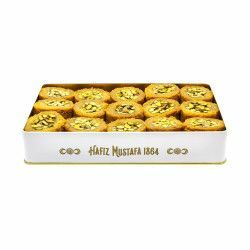 We pack Kadaif in a metal box, after vacuuming it in a very secure way.